Unwind in a quiet pool after the day packed with action. Care for a round of tennis? Resort's tennis court is waiting for you. The game room has everything your kids need to keep them busy for hours: wii station, foosball, basketball and much more. Show off your culinary skills while the family kicks back! Roll out of bed, grab a cup of coffee and head out to the porch to see what the birds are up to. The Suites at Fall Creek by Diamond Resorts is located near the best attractions and entertainment that Branson has to offer. Once everyone gets settled in your condo, get changed into swimsuits, grab water wings and apply sunscreen before heading to the pools. This lakefront resort features both an outdoor pool and an indoor pool so you can go for a relaxing swim even if the weather isn’t cooperating. Lounge poolside with the latest issue of People magazine and work on your sun-kissed look. Little ones will love the children’s playground. They can run off all of their energy just in time for their afternoon nap. If that doesn’t work, a round of mini-golf or a stop in the game room should do the trick. Hungry? Take advantage of the BBQ Grills and have a cook out. Recruit the kids to help carry burgers, hot dogs and sides. Lay out toppings and condiments and let everyone have at it. Modest Studio condos sleep two guests. Kitchenettes with a mini fridge, microwave, and two-burner stove allow you to make the basics. One- and Two-Bedroom condos sleep four to six guests. Full kitchens have everything you need to whip up anything from cookies to lasagna. Up for a family movie night? Good news! Flatscreen TVs with DVD players have you covered. The resort offers free DVD rentals, or bring favorite movies from home. Pop some popcorn, gather everyone on the couch and pick the first movie. The last thing you want to do when you get home from vacation is laundry. Thankfully, One- and Two-Bedroom condos include an in-suite washer/dryer. After a long day exploring Branson, relax with a drink and enjoy the view from your screened porch. The Suites at Fall Creek are just a short drive to the Branson Theatre District. There are more than one hundred shows in Branson and some of the most popular are Amazing Pets, Million Dollar Quartet and the Branson Murder Mystery Dinner Show. Dolly Parton’s Dixie Stampede Dinner Theater provides an exciting show featuring thirty-two horses and horse riding stunts along with a four-course meal. Silver Dollar City is a family theme park with over forty rides and attractions including roller coasters, a train ride, and a whitewater rapid ride. Gather the shopaholics in your crew and head to Branson Landing. Well-known stores include Bath & Body Works, The Children’s Place, and Brookstone. Find Branson souvenirs at the Five & Dime General Store. Surprise the kids with a visit to Build-a-Bear where they can build their own stuffed animal. Hungry? There are several restaurants at Branson Landing to choose from. Try St. Louis-style barbecue at Famous Dave’s, seafood at Joe’s Crab Shack or pizza at Pie Five. - The credit card used to book the reservation must be presented at the time of check-in, along with a photo ID. For more details, please contact the office using the information on the reservation confirmation received after booking. Located just a short drive from Branson's Theatre District. Enjoy fishing, scuba diving or numerous water sports. Sightsee aboard the Spirit of America. 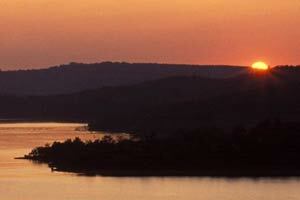 Showboat Branson Belle offers a two-hour cruise featuring food and live entertainment.